The Botetourt County Museum is located in Fincastle in what is called "Courthouse Square," at the rear of the courthouse. The building used to be a law office, and one room is set up to resemble that. The structure also was part of a hotel complex at one point. Botetourt County was created in 1770 from Augusta County. It was named for Norbourne Berkley, Lord Botetourt, who was a beloved governor of Virginia from 1768 to 1770. As you can see from the photo of the map above, at one time the county went all the way to the Mississippi, taking in Kentucky to the south and going as far north as a little piece of Wisconsin. People who lived far away were excused from jury duty, by the way. The museum has many period pieces from prominent families. Displays include housewares, toys, clothing, and utensils, among other things. This is difficult to see because of reflections, but this houses what is believed to be the original bell from the first courthouse. 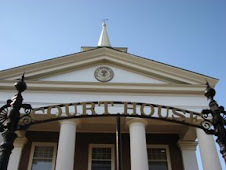 The county has had at least three different courthouses. In 1970, the courthouse burned but the records were saved because they were inside a massive room-sized fireproof vault. The courthouse was rebuilt from plans that are said to have originated with Thomas Jefferson, though no one is 100 percent certain of this. As a piece of trivia, my husband's father fought the courthouse fire as he was a volunteer fireman at the time. Speaking of relatives, this coffee grinder belonged to Philip Firebaugh, who is my husband's great, great, great, great grandfather. Philip Firebaugh came to Botetourt in 1818, allegedly with saddlebags full of gold, and purchased property known today as Stonelea (or the old Philip Firebaugh place if you're an old timer). It is no longer in the family. This is a portrait of James Breckinridge. Breckinridge was a lawyer and statesman, and the museum is located in what used to be his law office. Breckinridge also fought in the American Revolution. He served in the Virginia House of Delegates and in Congress. He assisted Jefferson with the construction of the University of Virginia. He owned a vast amount of property, which was and still is called "Grove Hill." One of his descendants, Lucy Breckinridge, lived at Grove Hill and kept a diary during the Civil War, which is sort of famous. I've read it and it's quite an interesting look at life during those turbulent times. The book is for sale at the museum.